I’m Sarah-Lee Terrat, and I’m YeloDog Design. I have over 30 years of professional design and fine-arts experience — my specialties are illustration, custom-created murals, and consulting for environmental design projects. Often my clients have chosen to overlap these services, as you can see in many of the examples on this site. 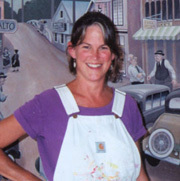 My illustration skills, my ability to work purposefully with color, and my enjoyment of the collaborative design process have led to successful consultancies and projects with clients as diverse as Ben & Jerry’s, all of whose scoop shops I designed from 1985 until 1997, Staten Island Childrens’ Museum, Vermont Childrens’ Hospital, Stowe Mountain Resort, Green Mountain Coffee Roasters, King Features Syndicate, NRG Systems, Inc., Turtle Fur, Inc., and private clients including the musicians Trey Anastasio and Mike Gordon. Visit kudos for much client feedback. I listen carefully to my clients and make sure I hear their concerns and needs. I give options in sketch form early in the process. I work well with other design and production specialists. I find the collaborative design process can be professional, enjoyable, and very productive, no matter whether you’ve been through it many times or never before. I enjoy creating art that will have a life in places where people don’t expect to interact with it. Art belongs in the thick of everything! Creative work can then become a part of people’s daily lives, without the need to visit a museum or a gallery. Every day, my published and painted works are engaging and entertaining people from all ages and stages of life. Just click here if you would like to connect with me about my work, or to talk with me about a project. I hope to hear from you! Sarah-Lee is available to teach and provide art residencies in schools, art organizations and communities. Her teaching experience spans 25 years, where she has worked with each organization to provide a custom plan appropriate to their specific needs. Workshop and Discussion on the design process for a group of university art students (University of Vermont in 1998). "I think it's a really big contribution to the school and the community." Contact Sarah-Lee to discuss planning a custom residency for your organization.